Bente Torjusen, AVA’s Executive Director, was recently interviewed by Sarwar Kashmeri in Enterprise’s Power Lunch series.! Click here to download and read the entire interview. 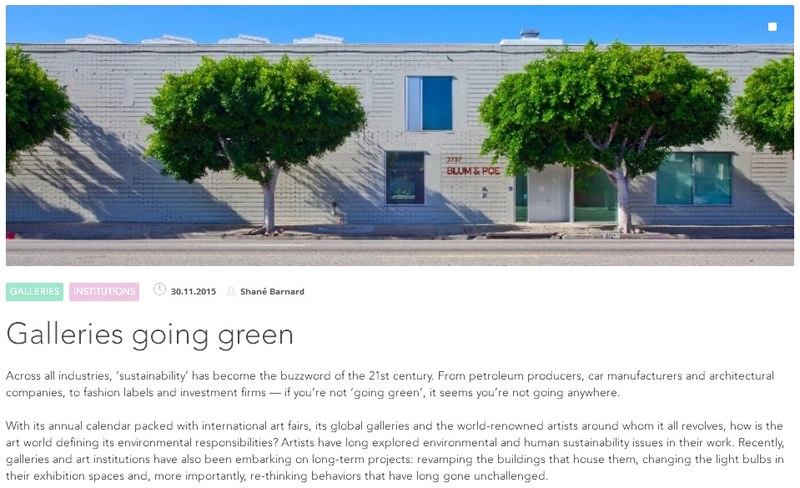 Click here to see AVA featured in Shané Barnard’s article Galleries Going Green for Happening. The National Trust for Historic Preservation is featuring AVA in their recent article, From Factory to Art Gallery in Lebanon, NH. Adaptively reusing an old building can have benefits both tangible and intangible. 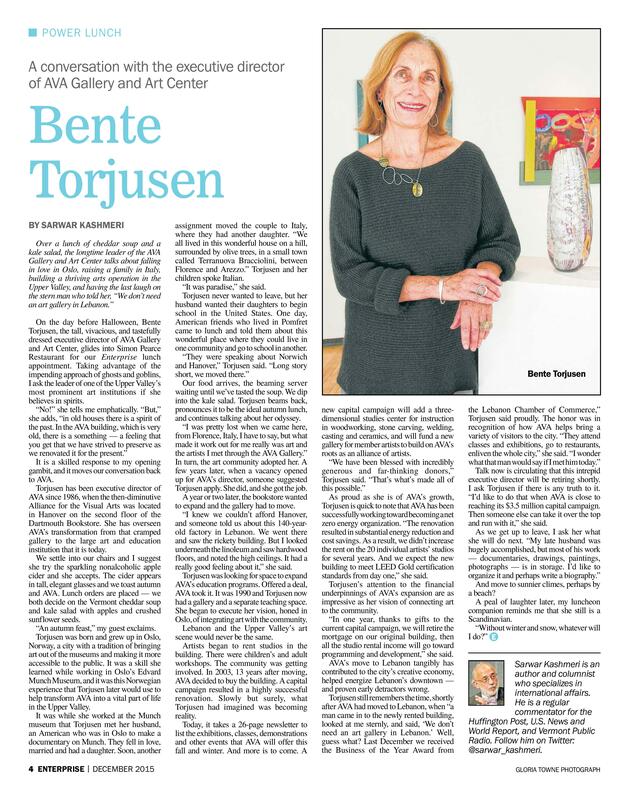 Just ask Bente Torjusen, executive director of AVA Gallery and Art Center in Lebanon, New Hampshire. Several years ago, the organization purchased and renovated the 1850s former H.W. Carter & Sons overalls factory and turned it into an energy-efficient art center with studios, classrooms, and exhibition space. When we talked with Torjusen about local travel ideas for the Fall 2015 issue of Preservation magazine, we found the AVA Gallery story so interesting that we asked her to elaborate on it. Excerpts from our conversation with her are below. Last November, during the presentation of the Hanover Area Chamber of Commerce (HACC) Business and Community Leadership Awards, much praise was bestowed upon AVA. As noted in our previous publication, AVA was the recipient of the “2011 Business Innovator of the Year Award”—one of four HACC awards. We wish to express our gratitude to Peter and Jane for their generous support and gracious sentiments; to former AVA Chair Linda Roesch, who spoke compellingly about AVA; and to Hanover Area Chamber of Commerce for so masterfully organizing the award ceremony and producing the impressive program for the event. (This publication showcases AVA in a stunning double-page color spread.) Finally, we wish to congratulate our fellow winners: Advance Transit; Julia Griffin, Hanover’s Town Manager; and Lou’s Restaurant. AVA Receives a Hanover Chamber 2011 Business Innovator Award! We are thrilled to announce that AVA Gallery and Art Center will receive the 2011 Business Innovator of the Year Award from the Hanover Area Chamber of Commerce (HACC). HACC will present four awards to individuals and businesses who, in accordance with the chamber’s mission, have contributed in various ways to invigorate the economic health of the Upper Valley, while adding to its well-being. Doug states, “AVA’s impact in Lebanon and beyond is awesome!”… a claim we will surely not refute!